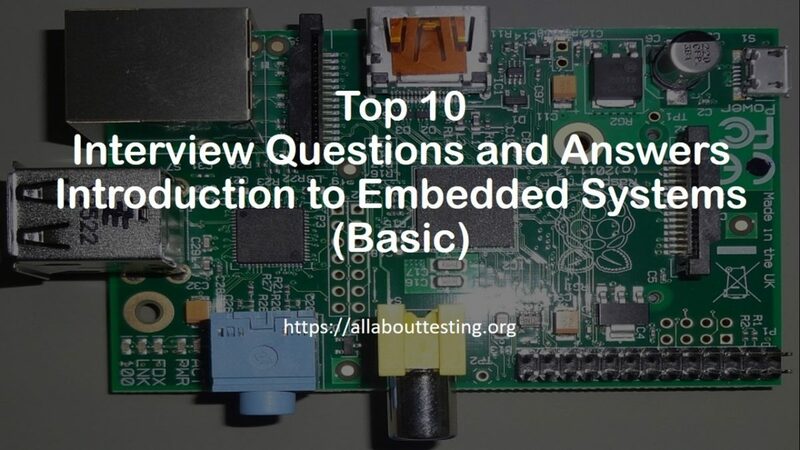 Here we will discuss Top 10 Interview Questions and Answers on topic Introduction of Embedded Systems. This article is perfect for beginners who wants to increase understanding of embedded systems. I believe covering Questions and Answers are the best way to enhance knowledge in any new field. Q1. What is Embedded System ? Ans: Embedded system is programmed hardware device and is basically construct to solve one type of specific problem and has only limited resource such as RAM, I/O console etc. available based on the requirements of such problem. In simple terms, here requirements/specific problem dictate the characteristics of embedded system. Q2. What are the practical examples of embedded systems in airplane? Ans: In Airplane, numerous embedded systems are used for different purposes such as maintain oxygen level inside airplane, determine the weather condition, altitude, location, orientation, speed, fuel indicator, autopilot feature etc. These features significantly helps pilot by reducing the workload and prevent any other human error. Q3. What are the other applications of embedded systems? Ans: Other applications of embedded systems include Robotics, Security Devices and Access Control (e.g. RFID), Home Appliances, Automobiles, Manufacturing Industries, Nuclear Power Plants etc. Q4. What are the constraints of embedded systems employed in airplane? Security: It should be secure. Nobody able to access control system of airplane without proper privileges. Passengers not able to interfere/access any control system which may cause problems for pilot. Reliability: It should be reliable. 0.0000000000001% of error in any sensor output also may result into numerous accidents and human life loss. Ideally, probability of mistake/wrong results by the embedded systems employed in airplanes should be zero. Q5. Is Internet of Things (IoT) devices also example of embedded systems? Ans: Yes, IoT devices also consider as a example of embedded systems. Q6. What should be the characteristics of IoT devices? Q7. What is the basic system model of embedded system? Ans: Basic system model constituents are inputs (given by sensors), computation involved by processing elements (based on inputs) and resultant output (by actuators). Q8. How can we measure overall efficiency of embedded system? Energy efficiency: It is a simple measure of specific work performed by the system against the energy consumed during the process. Example: Processors energy efficiency is number of instruction executed per joule of energy. Code Size: Lines of code (code size) used for programming embedded system are kept in system. So, code should occupy minimal space and at the same time, it should be secure. Real-time constraint: It should meet real time constraints such as quality output within very less time, less prone to error etc. Q9. What are the different phases of development of embedded systems? Idea: Development of embedded system starts with an answer/idea of some specific problem. Specification: Lot of mind-storming session happens during this phase to collect the specification which solves the problem. It ends with listing of hardware and software components required for the development of system. Repository: While development, repository has been created for proper versioning control (to roll back if something wrong happens). Iteration: Internal Testing and redevelopment based on results of test cases until development team satisfies with the system. Evaluation: Evaluation may be done by internal or external team based on specifications developed in the initial phase. Validation: Validation is generally audit by external team to confirm the efficiency of embedded system. Optimization: Based on the results in different phases, optimization has been done to increase the efficiency of embedded system. Q10. What are the different design models for the development of embedded system? Ans: Like software development, there are different design models for the development of embedded system such as waterfall model (requirements freeze before development), iterative model (simple implementation first and later increase complexity and features in later stage) etc.